Here are some of the more noteworthy things available in the Neon milestone build M6 which is now available for download. Caveats: We're aware that some scaled images look bad at scale factors less than 200%. This will be improved in M7. Furthermore, we're working on support for high-DPI images in Platform UI, so that plug-in providers can add high-DPI icons without doing any code changes. On GTK+ this key binding was previously assigned to the Display command as a workaround for Ctrl+Shift+D not working. New options in code formatter A few new options have been added in the formatter profile editor. Support for OSGi Declarative Services Annotations OSGi Declarative Services provide a powerful mechanism for developing complex, service-oriented applications. With proper tooling, annotations, which were added to Declarative Services in version 1.2, make it easy to generate and maintain the required component descriptor files. 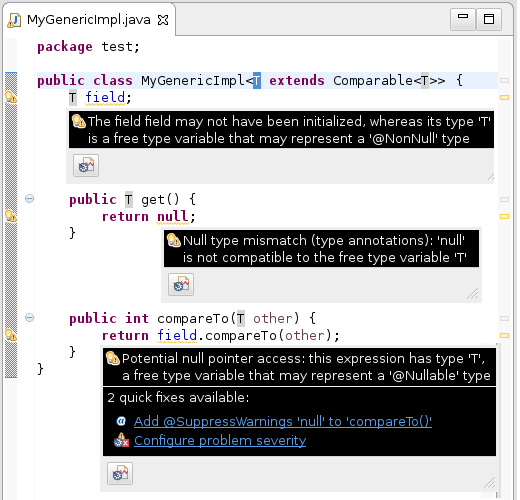 When enabled, PDE automatically generates and updates Declarative Services component descriptor files from appropriately annotated Java source. This is done without requiring any additional builder to be configured in your project. When you annotate your component implementation classes with @Component, and any reference bind methods with @Reference, PDE will validate your annotations and generate the corresponding component descriptor files. 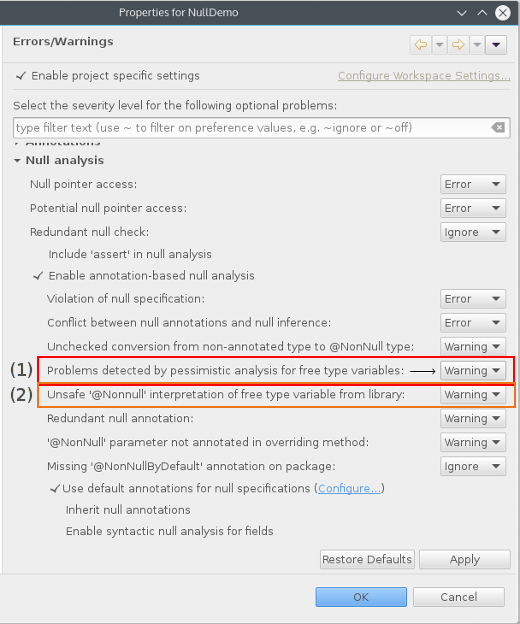 Any errors discovered during validation are highlighted and reported. In addition, PDE will also maintain the project's MANIFEST.MF and build.properties file -- generated component descriptor files are automatically added to the manifest and included in the build. To enable this feature, go to Preferences or Project Properties > Plug-in Development > DS Annotations and check Generate descriptors from annotated sources. 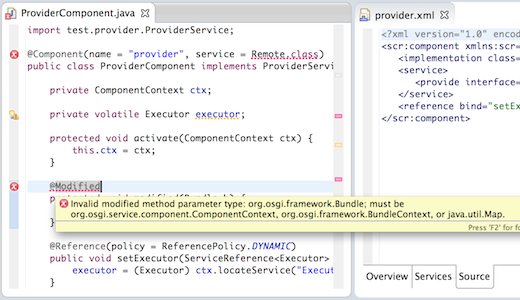 Updated OSGi Declarative Services Example The OSGi Declarative Services Example now uses annotations. Instead of creating a Component Definition file for each component class and adding it to the manifest and build.properties, the wizard creates component classes annotated with the appropriate DS annotations, which are then used by PDE to automatically generate the corresponding component descriptor files. Pagination control in Plug-in Image Browser In the Plug-in Image Browser, at the end of the view, there are pagination controls to move to the next page of images. 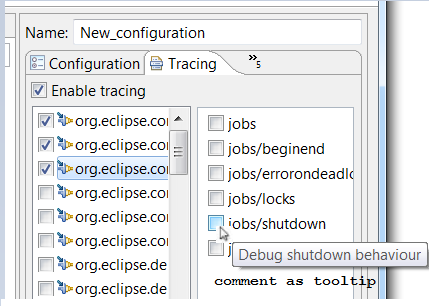 Tooltips for options in Tracing dialog In the Tracing tab of Eclipse launch configuration, the options now have tooltips which display more information about that option. The information gets extracted from comments in the declaring bundle's .options file. APIs for high-DPI monitor support Platform-independent high-DPI support has been added to the Win32 and GTK ports. 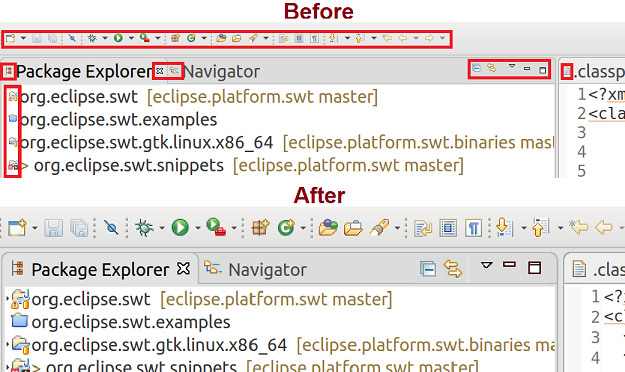 In the past, only the font size was adjusted on those two platforms, which lead to an inconsistent appearance of SWT applications across different platforms. To shield existing clients from resolution differences, SWT now uses the Cocoa model on all three platforms. Existing SWT APIs keep using the well-known coordinate system in SWT points. In high-DPI environments, these SWT points are transparently scaled to native pixels. Two new APIs have been added in Image to give you direct access to the pixel data on high-DPI monitors. SWT requires 1.7 Java runtime The SWT projects are now compiled at 1.7 compliance level. As a result, a Java runtime of 1.7 or above is required to run SWT applications. API to set Link color A new API org.eclipse.swt.widgets.Link#setLinkForeground(Color) has been added that allows you to set the foreground color of the hyperlink text in a Link widget. The corresponding getter Link#getLinkForeground() has been added which returns the foreground color of the hyperlink text in the Link widget. For an example, see Snippet182. Imports of the javax.annotation package no longer require a minimum version Plug-ins are no longer required to specify a minimum package version when importing the javax.annotation package. 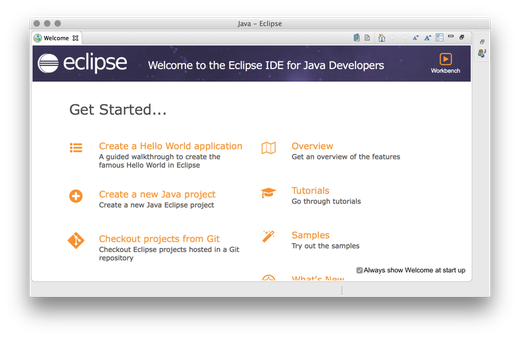 The Eclipse runtime will resolve all components to the same version (JVM or provided by the Eclipse Platform). This avoids a common error in Eclipse RCP implementations in which @PostConstruct was resolved to different classes in the bundle classpath. This change is backwards compatible, i.e., a dependency with a minimum version still works correctly. New factory method for data binding's ComputedValue An org.eclipse.core.databinding.observable.value.ComputedValue can compute custom values from other tracked getters inside its calculate method. Before this change, you had to create a subclass of ComputedValue, but the new create method, which expects a Supplier<T> allows you to create an instance of ComputedValue by using a lambda expression. ComputedValue.create(() -> personFirstNameObservable.getValue() + " "
More details about tracked getters can be found in the org.eclipse.core.databinding.observable.ObservableTracker's getterCalled(IObservable) method. Almost every IObservable's get methods are tracked getters. 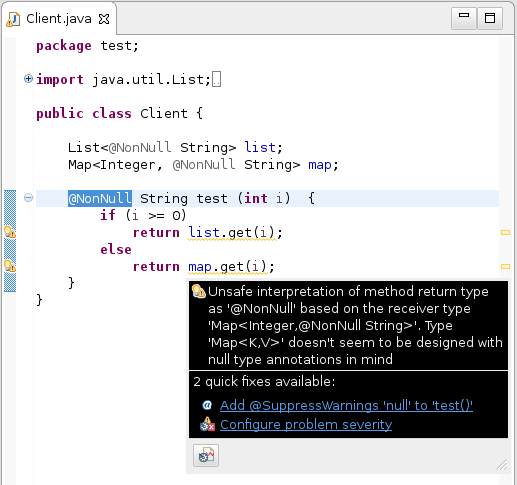 Change closeable attribute of MPart at runtime Calling the setCloseable method on an org.eclipse.e4.ui.model.application.ui.basic.MPart instance will now change the visibility of the close button for the corresponding part. Shutdown started event for Eclipse 4 RCP applications When Eclipse 4 RCP applications are about to shut down, the org.eclipse.e4.ui.workbench.UIEvents.UILifeCycle.APP_SHUTDOWN_STARTED event will be fired now. Previously, this only worked for Eclipse RCP applications running in the compatibility mode, and in mixed mode applications which use both Eclipse 3 and 4 APIs.